This page contain assets (models) that can be used when modifying a Trespasser level. These assets can be in a level format (models need to be extracted by user) or in a format ready for import (usually .TPM format). Happy christmas! Here are some new dinosaurs for you, including a Spino! Well I just started playing around with the different blending modes in photoshop, and was able to come up with a bunch of variations for skins for the raptor model. In the pic, they are shown on an edited version of the tc-isle raptor which Ihaven't yet been able to get rigged properly. Still working on that. But the skins will still work on the standard tc isle raptor mesh. In my laziness I didn't clear out any extra stuff that might be inside these folders so that should be up to you. I think all bmps are 24bit so they'll need to be converted. Yeah my altered tc-isle raptor mesh was included. However it doesn't really work in game, so I wouldn't suggest importing it. As far as the low polyness of that model, it did that itself when I opened the mouth. I believe a similar thing happened when machf made a closed mouth version of the T Rex. Not sure why it does that. Anyway though the reason I made it open mouthed was so I could rig it better, hopefully to get it to work with the raptor bones. I spent a few hours going back and forth positioning it to try to get it to work on the raptor bones, without having to change it. didn't ever get it to look quite right, and I always had some problems assigning vertices due to the closed mouth, hence why I edited it to create an open mouthed raptor. It would be nice to see the model in some kind of game, with those textures. But either way, I think I ended up with some cool looking textures. Based on version 2 of Start Level, this level contains all of retail Trespasser's "jungle" foliage from BE to IT, conveniently added into a localized basement area. Perfect for beginning modders desiring a fully diverse jungle environment. We've also got a new creature, created by Slash_Master. Download his model of a wicked "deinocheirus" right now! Note: we are also providing a re-exported mesh that can be properly opened in TPDC or 3DS MAX/Gmax with the bones being recognized as such. 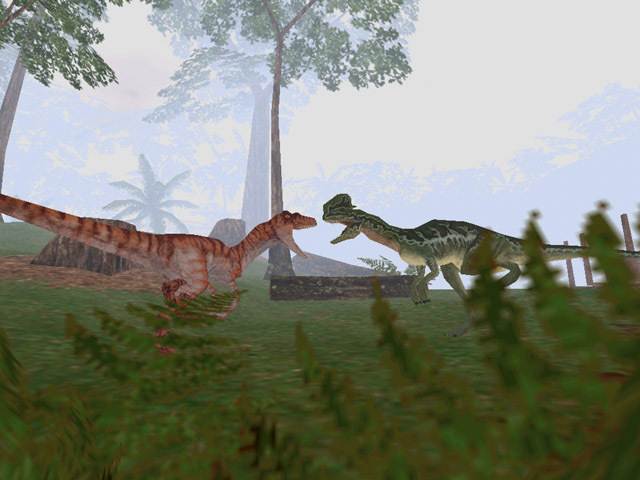 Based on version 2 of Start Level, this level contains one basement mesh of each dinosaur found in retail Trespasser (including RaptorCBoss), as well as one ingame reference model for each (other than the Brachiosaurs). Designed for beginning modders to streamline CAnimal sourcing from the retail. This is the first skin ever created. It replaces the original T-rex skin with a brand new green one. It is really worth the download. So do not hesitate and download it. Model is the Green TRex not seen in the retail version of trespasser. The model is in .tpm format and ready for import. Original Max Scene of "IJVegMasters", containing the basement foliage used among some of the Trespasser levels. Original Max Scene files for the Town level during its development progress between 1998-06-11 and 1998-06-15. The versions have some noticeable differences. It does not include any textures but provide some interesting insight of Trespasser's development. What I hope this becomes is a go to source for making Isla Nublar related content. Right now it's a collection of models, textures, and unfinished rtf files. Also none of the pallets are set. If multiple TPMs exist in the same directory, all need to be imported for the model to work. This is because I haven't had the chance to clean up the files yet. Also I think the gates mesh included is the one that DOESN'T work. I have another one that does work that is in the SNES project. Also included is some JPO terrain heightmaps, screenshots, various useful images and maps, and letters isolated from the end credits. There's also a transcript of all the dialogue that I could find in JP SNES. If you have any comments on this, please let me know so I can make some fixes/changes in the future! We've also got another package of skins up for grabs, provided by Second Illiteration. Download the Operation Genesis skins theme, which includes skins for the TribeA raptor, T.Rex, and albertosaurus. S.I. also has released an upgrade for the Tribe_A raptor skin that was released. Make sure you download the additional file, to get the correct skin. The title was confusing, I know. To clarify, all the skins I have created are for Trespasser. In most cases though, they are skins for the OG meshes that have been imported into trespasser. Original Max Scene files of Jungle Road containing several max scene files from how Jungle Road looked in April 1998. The level is split between several max files which is how the devs worked on a level back during development and it gives an interesting insight on the development process. This package also includes several textures along with some of the original Photoshop source files later used for some textures. Second Illiteration also has another pack of skins up for download. These skins are themed "Jurassic Park 3". The package features the male and female raptors, spinosaurus, and Operation Genesis T.Rex. Get this one hot off the press... erm... net. We've also got a new pack of dinosaur skins, whipped together by the talented Second Illiteration. This package's theme is "Jurassic Park Movie," and includes skins for the Operation Genesis Brachiosaur, T.Rex, and TC_Isle raptor. Download the package. Note from S.I. : I made a mistake with the brach skin, and some parts may need to be resized to 256 X 256. T Joe deserves the most credit for these three skins. I just fitted them to the models. See more of his work at the Modding Genesis site. And there's a level in there that you wanted called JPOTestLevel, WH... That level has all the interior goodies I made for the control room JPO, but I believe they still have my old Connection Machines where the LED texture is on wrong so that it goes up and down instead of side to side... And there's a "More Complete" Visitor Center, which by that I mean it has more of the furniture I had made that didn't get ported over to the later level yet. Model is the long clawed brown raptor not seen in the retail version of trespasser. The model is in .tpm format and ready for import. Creating an entire level all by yourself is now possible with the newest version of TresEd. So this level should be seen as a step-by-step tutorial of doing so. Simply download the level, extract it and follow the tutorial in "minilev.txt". Full set of TSOrd's missing models, some of which were never used in the final game. This file includes the authentic 3ds Max scenes containing the models last touched by the DWI modelers back in 1997/1998. The textures also include original bump maps. Special thanks goes to "Owyn Beleforte" and his friend. We owe you guys big time! A second set of authentic 3ds Max scenes last touched by a DWI modeler back in 1997/1998. This set also contain the only part of the level "Plains" we have in 3ds Max format. Does not contain any terrain, but foliage objects and the "Block House". Asjad's entry for the TresCom contest. Model is of the Para not seen in the retail version of trespasser. The model is in .tpm format and ready for import. We have more skins from Second Illiteration! Download "Random Pack 1" to get more skins for the TC_Raptor, OG T.Rex, and Albertosaur. And don't forget to download the second skin package, "Random Pack 2", provided by Second Illiteration. We've also got one more skins pack from S.I. Grab "Random Pack 3" and check out some more of his fantastic work. Some really cool stuff for you to use in your level "The jungle plants include some bushes, some background bushes, palm tree's, banana plants, and various shrubbery. Pine tree's are a few green ones and two dead ones"
Model is the short clawed brown raptor not seen in the retail version of trespasser. The model is in .tpm format and ready for import. A set of .BMP images converted from Zandor's Sorna map to be used as textures together with the .TPM exported terrains contained in the TresMerge.rar file. Well, what Christmas season would be complete without a pair of red and green t-rexes? Forum member Second Illiteration has released these two creatures, and they are ready and waiting for a home in your level! Here's an update for the TC Enhanced Spitter to bring it to version 3.0 (version 1.0 being the original TC Dilophosaur seen first in TC Isle and version 2.0 the Enhanced Spitter available for download in a standalone level). After you've installed the Enhanced Spitter (download it if you haven't already done so, and follow the instructions), replace the .scn and .grf files with the ones contained in this .zip file. There's also an in-game video of the Spitter in action in HD (1280x720p@20fps), it's 8.41MB if you want to watch it. It's a 50s video encoded with the XviD video codec at 4500bps two-pass VBR and LAME MP3 audio codec at 160kbps CBR. This minilevel has a collection of weapons found throughout the Internet and converted for use within Trespasser - which means they've been scripted and tested. If you're looking for additionl guns for your levels, this is a good place to look. This minilevel has a collection of trees and plants found throughout the Internet and converted for use within Trespasser - which means they've been scripted and tested. If you're looking for additionl vegetation for your levels, this is a good place to look. From the news post: "And you thought it couldn’t get any better… …well, you’re wrong. It just did! Allow me the privilege of introducing you to the newest member of the TC Ops dinosaur family – “The TC Enhanced Spitter.” What’s the enhancement, you ask? Why, it actually spits and uncurls its frill! Don’t believe me? Grab the level, download tc_enhanced_spitter.zip from FilePlanet, and see for yourself. A spitting spitter, who’d have thought?" Don't forget the download the 3.0 update futher down the page. "So I've been working back and forth between RTJP and Tres~HD, when I suddenly stumbled across that flora test level that I uploaded a screenshot of on the Beach HD thread. I'd totally forgotten about this and, after taking a good look at it, decided it shouldn't just sit around on my hard drive forever." Basically, a companion program meant to make adding sounds to .tpa files using tpaAdd easier. TPM import and export scripts for 3D Studio MAX and Gmax. The import script is tpmimport2.ms and works on both, the export script for 3DS MAX is tpmexp124y.ms and the export script for Gmax is tpmexp124y-gmax.ms. Just place the scripts in the /scripts/startup folder of your MAX or Gmax folder and they'll be automatically loaded when you launch the program and will appear on the drop-down list on the right panel when you open Utilities->MAXScript. For Gmax, better clear the MAXScript listener before exporting, and use GMaxSLGRAB to save the output to a .tpm file. This is a "quick'n'dirty" MAX script converted from the TPM import script that lets you import Trespasser Terrain Triangulation (.TRI) files, those converted by GUIapp from .wtd files. Works both in 3ds Max and Gmax. Hi people, I Just finished "The Trophy Room" ver. 1.0. I would like to get a release for this, but I don't know if it should be in "others" and not in "levels", because there is almost nothing of level mod. This is more about new objects, most of them are dinosaur head trophys, but also three new dino skulls. Enjoy it. This is a "quick'n'dirty" MAX script converted from the TPM export script that lets you export Trespasser Terrain (.TRR) files, those which GUIapp can convert into .wtd files. Works in 3ds Max only, for Gmax get the corresponding version. In version 0.0.2, I made some fixes to my original version 0.0.1, which was conflicting with the TPM export script, since they were using functions with the same name. Now this is version 0.0.3, made some changes so that coordinate values would be rounded to prevent GUIapp from crashing when attempting to create a .TRI file from the .WTD terrains it generates using the exported .TRR files. This is a "quick'n'dirty" MAX script converted from the TPM export script that lets you export Trespasser Terrain (.TRR) files, those which GUIapp can convert into .wtd files. This is the version modified to work with Gmax, although you can use it with 3ds Max too (but why?). Make sure to clear the MAXScript listener before exporting, and use GMaxSLGRAB to save the output to a .tpm file. Originally, hppav converted the 3ds Max version 0.0.1 to work with Gmax (which I had omitted), then I re-converted it again after making some fixes in version 0.0.2. "This is a small mod I did a long time ago for a user who wanted to replace the weapon sounds with his own selection. I never released the file publically, and the user seems to have disappered since (if you're the one reading this, feel free to let me know who you are! ), so I've decided to put the file up for download. It works as an additive Effects .TPA file which you can attach to your mod in order to replace most of the gun sounds with these excellent new ones!" Level template and engine from the 2011 Winter Contest. This is a great template for all future winter levels. Comes with it's own engine. Note: Don't forget to download Service Pack 1 below to fix a small error in the level. Service Pack 1 for the 2011 Winter Contest Level template. Fixes a small error in the level. New levels weren't the only thing to get excited about during Week of Trespassser 2007. In conjunction with Week-o-Tres, a contest was held. Draconisaurus whipped together a starter level, complete with setup triggers, and all the objects participants would need for the contest. The goal: Create the best level using the pieces already contained in the level. Only triggers could be imported into the level, but no new objects or textures (that was grounds for disqualification). Now the contest is long over, but the level can still be used as a template to start your own. Now contains the fix for the JPraptorA values. Any word on a “for dummies” install? Trescom’s best mods put into one patcher for new skins, frames, etc?